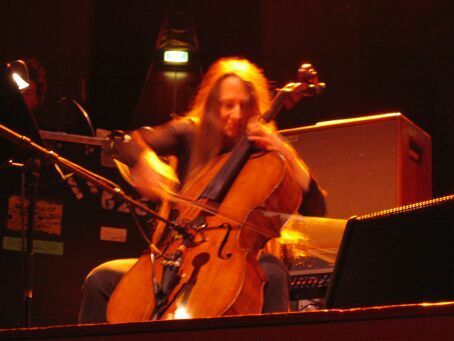 Cellist Jane Scarpantoni onstage in Amsterdam. This weekend, Sound Opinions will air its show-length tribute to the artist that Greg Kot and I consider one of the most important in rock history, and whose music arguably has meant more to us than any other: Lou Reed, who died on Oct. 27 at the age of 71. Even for those of us who were lucky enough to meet and interview Reed several times, many questions linger about what the man was really like. For some insights into the man and the artist in the days following his death, I turned to several musicians who were privileged to work on some of Reed’s best solo albums. Jane Scarpantoni is without a doubt the most celebrated cellist in rock history—her staggering list of credits includes 10,000 Maniacs, the Beastie Boys, Ben Folds Five, Helmet, the Indigo Girls, R.E.M., Bob Mould, Bruce Springsteen, and many, many others. Jane and I have been friends since the mid-’80s when she was playing in her first rock band, the psychedelic-pop group Tiny Lights, and I was writing about the scene at Maxwell’s in Hoboken, N.J. for Jersey Beat and other local fanzines. We weren’t able to include Jane’s stories about touring and recording with Reed on Sound Opinions, but I thought our interview was worth sharing for the insights it provides into one of her heroes. I’m also posting two video clips of Jane onstage with Reed performing “Burning Embers” from The Raven in 2005 and the Velvets classic “Venus in Furs” along with bassist Fernando Saunders, guitarist Mike Rathke, and drummer Tony Smith.